Dosshaus is the artistic collaboration of Zoey Taylor and David Connelly, multidisciplinary artists whose work ranges across the board with painting, sculpture, installation and performance to photography, film, and video. Wow, say that five times fast! They have an ongoing series entitled House of Cardboard, where they showcase reclaimed cardboard that has been transformed into vintage styled pieces that are either worn or used in these quirky scenes. 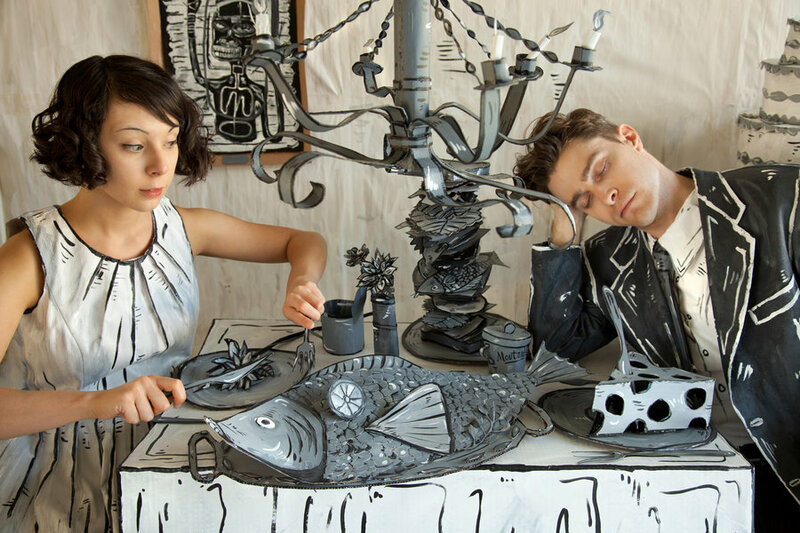 Each object down to the sewn garments, dining table of paper food, or freestanding camera are all hand painted in black and white and also blueish tones and affixed with glue, giving each piece an old fashioned feel, as if plucked from a vintage animation. Franco Giovanella, a graphic designer based in Jaraguá do Sul, a small town in southern Brazil, has been working in the graphic design industry for the last 10 years, particularly in advertising agencies and other studios. Becoming tired of working towards solely the final product, Franco opted to start enjoying it and adding a dash of fun, hence the birth of Rendi Studio, an agency focusing primarily in tactile design. 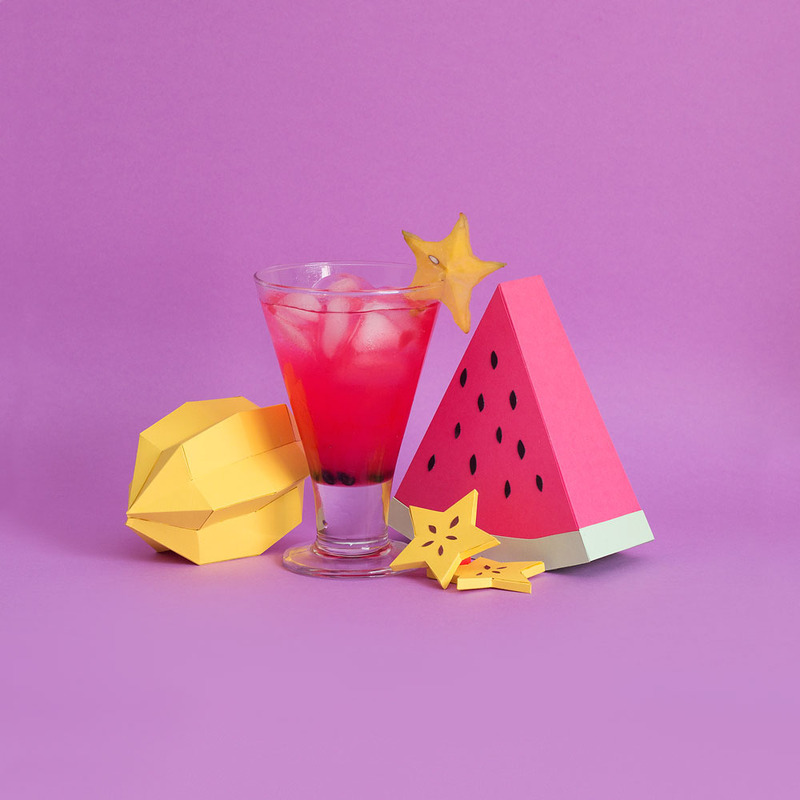 This collection of delicious looking drinks all have their colorful ingredients crafted out of paper and who doesn't love a little bit of paper food, I know I do! 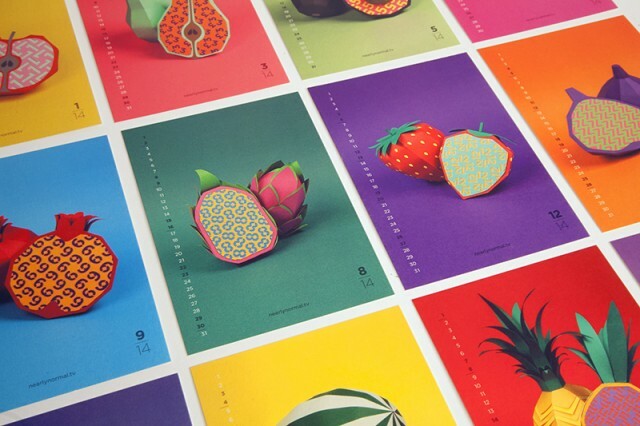 Similar to Nearly Normal's paper fruit calendar, these polygonal fruits burst to life! We love our fair share of paper food sprinkled throughout the site, hence the need to include this gem, especially for pizza lovers! 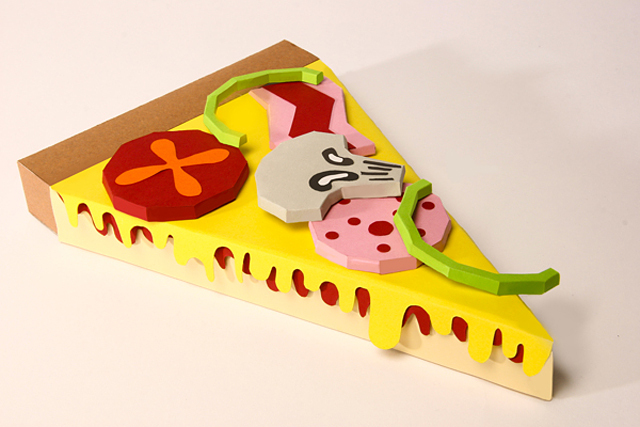 The lovely pizza paper sculpture you see before you is a collaborative submission by Leeds-based graphic designers Sebastian Needler and Andy Foster for YCN's Fedrigoni brief. 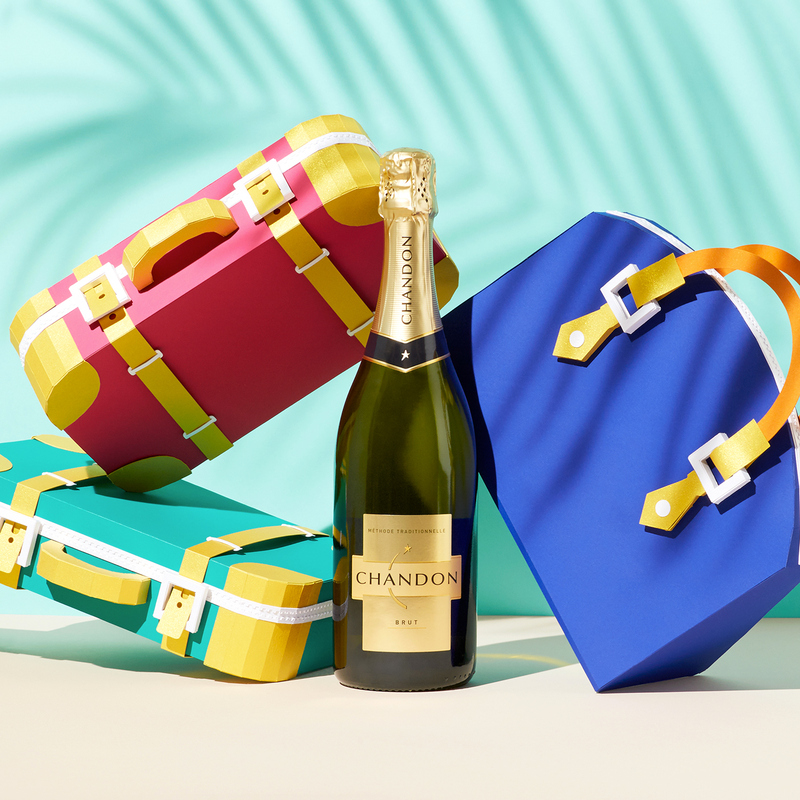 Within the brief they were asked to provide a range of products highlighting specifically the high-end stock, while also showcasing their versatility. They decided to link back to Fedriogini's Italian origins with arguably Italy's most famous food, the pizza. 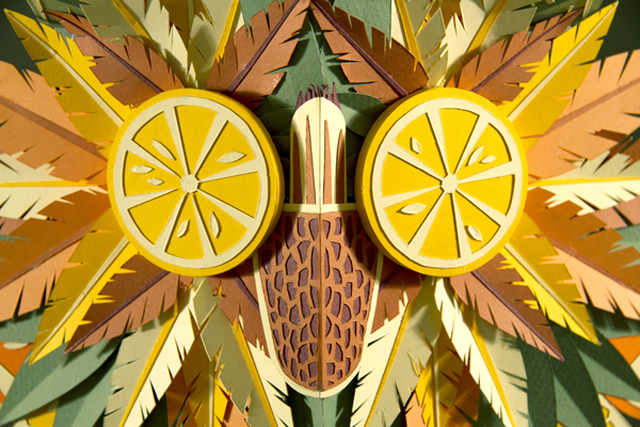 Known for their mastery in paper craft and thinking outside of the box, London-based design studio Nearly Normal are far and few in between when it comes to showcasing their talent. You may remember one of their projects "The Wolf I Used To Be..." a beautiful stop-motion animation where a wolf wants to become a man and then realized he is better off where he was in the beginning. In this installment, Nearly Normal has created a calendar, but with a twist. The entire calendar is made out of paper and each month shows a different fruit cut in half with the patterned numbers of that particular month on the inside. I love the colors and I think the project itself is beautifully done. 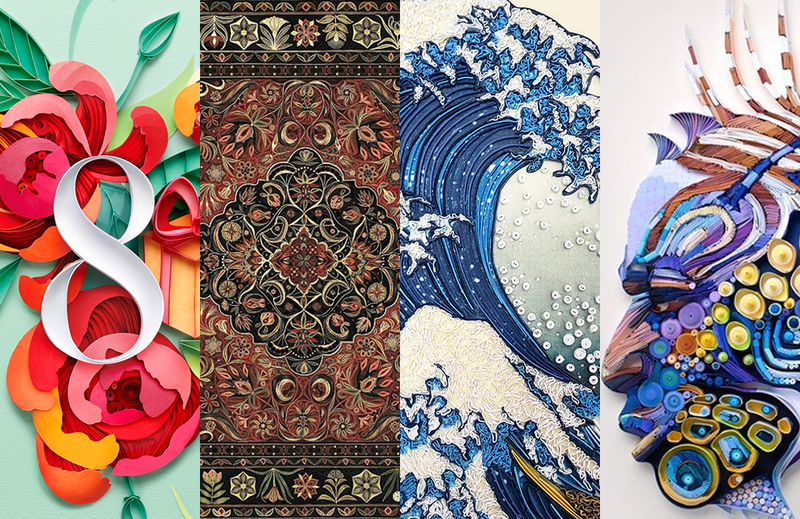 Each of the items were paper crafted by Victoria Bee, Rita Araujo, and Cris Wiegandt. 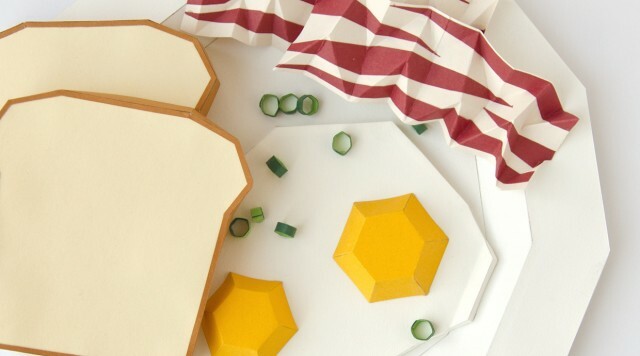 This isn't the first time we have featured paper food on our site. 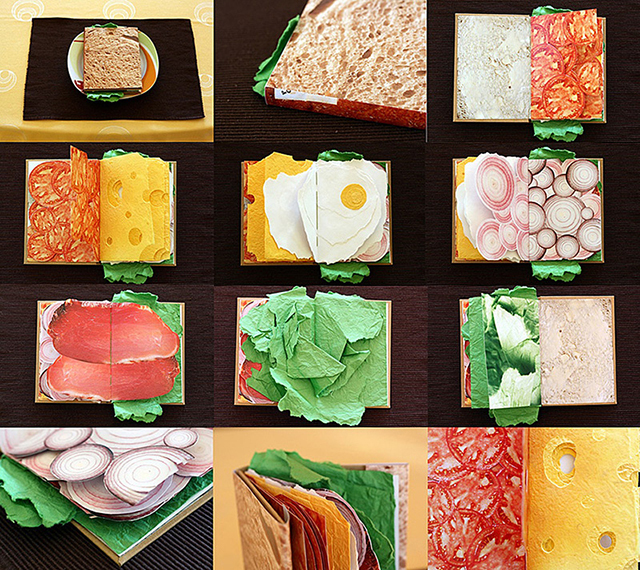 Wrocław-based artist and designer Pawel Piotrowski has done just that and created The Sandwich Book, a book completely made of paper where it's pages are the common ingredients found in a typical sandwich. YUM! Primprim is a creative communication studio based out of Lithuania where it's heads Catherine Žilinskienė and Miglė Vasiliauskaitė have created this very cool installation that represents fonts as paper foods. In their series "Taste the Font" they have taken popular dishes, made them from paper and have associated each dish to different typography for Vilnius Design Week. Zim and Zou have been peppered throughout the site with their numerous projects that are all innovative, unique and extremely colorful. These projects range from a paper tape cover for your usb to a bright blue burger on the cover of a magazine. 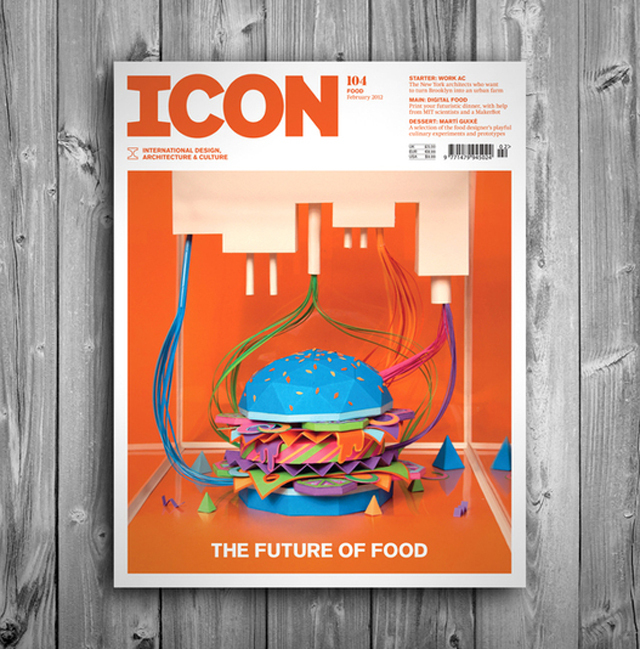 The latest installment from the talented duo Zim and Zou, is the cover for Icon Magazine's Issue 104: The Future of Food. The issue itself is about what food will be like in the future with their reflection being on 3D food printer technology. They have even supplied an animated gif! Stack it up, stack it up!